Peel the butternut squash and slice into 1/2-inch cubes. Place in heavy saucepan and put enough water over to cover. Bring to a boil over high heat, then turn the heat down to medium and continue boiling, stirring occasionally, for about 30 minutes, or until the cubes are soft when pierced with a fork. Remove from the heat and drain excess water. Leave cubes in the saucepan and mash. Add maple syrup, butter and nutmeg and stir until blended. 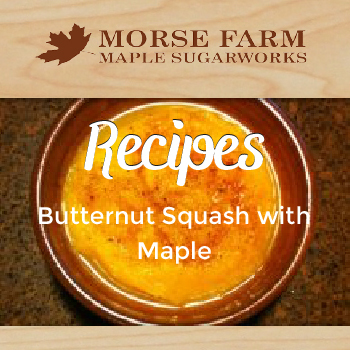 Serve with a drizzle of maple syrup and dash of cinnamon.